Invoking the energy of the Mountain and and all the light beings in and around. Resonating Love and Light with Sound. what a better place to enjoy doing sound to raise your consciousness. The workshop with cover a wide range of information on how sound affects us physically, mentally, emotionally and spiritually. We will practice techniques for healing physical issues including pain. We will use bowls to create brainwave entrainment. We will release stuck emotions that are stopping us from going to higher levels of consciousness. We will explore the frequency of our Soul and how to find it. We will also discuss the frequencies, pitch, timbres, musical intervals, music and energy of love. But most importantly, we will do many heart opening sound meditations using crystal bowls, Tibetan bowls, tingshas, gongs and the voice. We will also explore how to use tuning forks on the body. David will lead us into some powerful vibrational fields of gratitude, compassion, love and joy — as well as that place where we are one with the Universe. 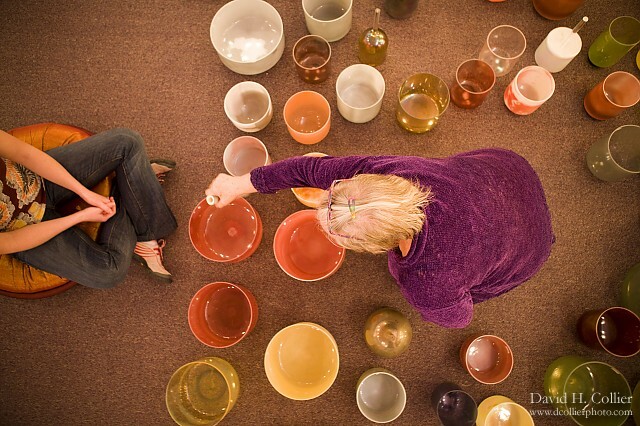 Beverly will use the alchemical bowls to bring us into a deep state of peace and non-dual awareness. Throughout the workshop we will be working with and accessing the energies of the mountain and the plethora of light beings that hang out there. David Gibson is a leading scholar in the field of Sound Healing and Therapy. He is the founder and director of the Globe Sound and Consciousness Institute in San Francisco. David is also the author of #1 selling book in the field, “The Complete Guide to Sound Healing.” David is also one of the top selling producers of Sound Healing music, and runs the Sound Therapy Center at the Institute offering over 15 types of sound healing treatments. David has produced 8 Sound Healing concerts, and 5 International Sound Healing Conferences. David’s mission is to bring Sound and Energy Healing into the mainstream (and hospitals). In order to do this he has setup the Sound Healing Research Foundation, and has also created plays and movies to help educate the general public. Beverly is a Crystal Bowl Master Alchemist and has participated in the Well-Care aspects of medicine and healing modalities of tone, movement and color since the early 1970’s when she taught “Personal Health and Changing Life Styles” at Sonoma State, California. At The Crystal Room in Mt Shasta she joined with Crystal Tones, based in Salt Lake City, Utah, in 2002. The consciousness of Crystal Tones’ Alchemy Crystal Singing Bowls (i.e. Rose Quartz, Amethyst and Ruby) integrated her energetic understanding of the mineral kingdom and sound healing. Crystal Tones at Mount Shasta was created. As a Crystal Bowl Master Alchemist she has participated in the inspiration and creation of the Citrine and Kyanite Bowls and all the multi-mineral vibrational Alchemy Bowl combinations. At Crystal Tones at Mount Shasta one can experience every kind of Crystal Tones Alchemy Crystal Singing Bowl in existence. There she teaches, gives workshops, group alignments and individual vibrational healing sessions. Through Sound Ceremony Beverly will demonstrate and you will embody the vibrational resonance of each Alchemy Crystal Singing Bowl, using various playing techniques. She will complete your understanding of the Healing Powers of these vibrational tools with your experience of the 21 bowl Diamond Alignment. You will learn how to amplify the power of your intentions using your voice with Crystal Tones Alchemy Crystal Singing Bowls. Sequestered in the Mt. Shasta foothills, Stewart Mineral Springs offers a unique environment of sacred mineral waters, affordable accommodations, and a variety of workshops and retreats. The indigenous Karuk Tribe has respected these springs for generations, and we’ve honored their devotion for 130 years. Our commitment to every guest reflects these values. The retreat offers soothing private mineral baths ($30), a wood-burning sauna (free), cool river plunges, and reflection and transformation gained from a traditional sweat lodge. When you visit the springs, you will notice the special care that has been taken to keep the land pristine. You will enjoy the majesty of the trees and gentle sounds of Parks Creek that provides the source of our waters. 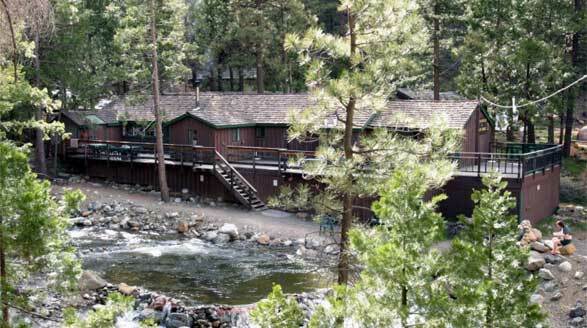 The relaxing environment of Stewart is tucked in a secluded forest canyon yet minutes away from Mt. Shasta and the Pacific Crest Trail. A perfect combination for a retreat. 10-1 and 2-5 PM Sound Healing workshop with David. 6:30-9PM Sound Bath and Ascension Journey with David and Beverly (with over 20 alchemical bowls). 10-1 ; 2:30 – 5:30 Resonating higher frequencies of Gratitude, Compassion, Love and Joy with Sound. The frequency of your Soul. Using sound to access Oneness and higher states of consciousness. Monday July 15th – 10-1 (optional) – Sound Meditation up on the Mountain at Bunny Flat. Transportation – If you are interested in carpooling, let us know and we will connect you with others. Refund Policy – If you cancel within two weeks before the event there is a 50% refund on the workshop fee. No refund on the rooms once booked. No refunds after June 15th, however you may apply your payment to future classes or events. The Hi-Lo Motel is about $50 per night. Motel 6 is only about $50 per night and allows pets. The Best Western in Weed is about $130 per night and is really nice. There are a few other hotels in Weed as well. You could even stay in Mt. Shasta, which is only about 15-20 minutes away. 1. Bring your own. Some rooms have kitchens. There is also a health food store in the town of Mt. Shasta 15 minutes away. 2. We have a caterer that will be providing meals if you like for the Retreat. The cost is $50/day/per person. That is broken down to $10 for breakfast, $20 for lunch and $20 for dinner. All ingredients are organic, and everything is made from scratch. There may be some changes depending on what looks freshest at market at that time. Local growers will have flourishing crops by then, and the peaches that come in from just across in Oregon are incredible!! Homemade Bircher Muesli with overnight oats, fresh apple, chopped pecans, golden raisins, almond butter and drizzle of maple syrup. Mount Shasta located in Northern California is a destination for mystics, gurus, sages and curious people from all over the world. Unexplained stories are endless and this enormous mountain is endeared by all who come to visit or live near her. This dormant volcano is not part of any mountain range. She’s uniquely her own mountain in many ways. 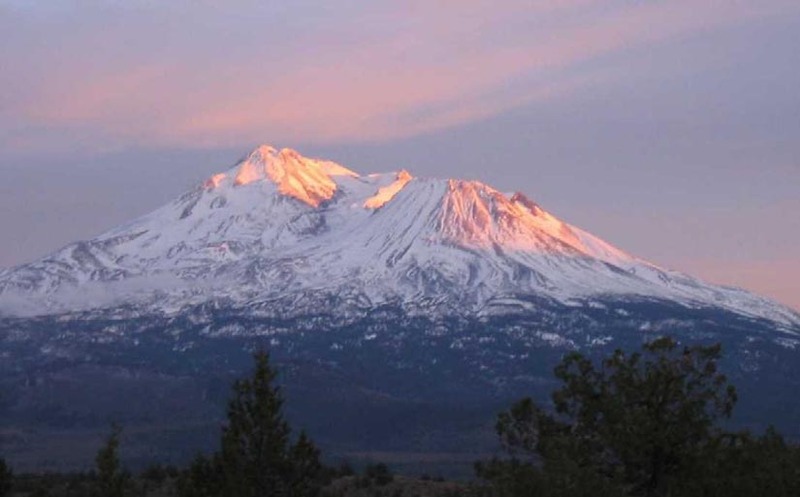 With a summit of 14,125 feet above sea level, Shasta is the second highest peak in the Cascade Mountain range. Her slopes rise abruptly nearly 10,000 feet above the surrounding landscape. Those who live in Mount Shasta the small town located on the base of the mountain, will tell you stories of encounters with Lemurians, the hidden city of Telos, Saint Germain, alien landings, and a certain special feeling that comes with being in the presence of Mount Shasta’s vital energy or vortex. Our ancient ancestors knew a vortex or a gathering place of the earth’s energy was sacred. This special mountain has such a vortex. Ancient cultures considered these vortexes, portals to a higher dimension of consciousness. If someone was near a vortex it activated and energized their etheric or energetic bodies making it possible for some to become aware of what mystics have discovered…our existence is multi-dimensional. Globe Institute offers complete Certificate and Associates Degree Programs in Sound Healing and Sound Therapy — the study of the effect of sound on human beings physiologically, psychologically, emotionally and spiritually. We are the only school on the planet that offers a Certificate and Associates Degree in Sound Healing and Therapy. The Program has been designed with careful consideration and experience to provide a full perspective on everything going on in the field — with due consideration for what students would most like to learn, and skills needed to be able to work in the field. We strive to stay on top of new developments and research in the field in order to provide students with the known science available in the field. But we also explore ancient esoteric and powerful techniques that include how to raise consciousness that have not yet been proven or researched. We have established a non-profit Sound Healing Research Foundation to help with the core mission of the school — to bring Sound and Energy healing into the mainstream (hospitals and homes). The goal of the Foundation is to educate students and the public on how to access funding for Research Projects. The Foundation has also be designed to help attract funding for important Sound Healing research — crucial to bringing Sound Healing into the mainstream. Students in the Degree Program get to do sound healing research projects on their own, or join with others who are doing Sound Healing Research within the Foundation. We look forward to working on unique and world changing research projects that any student might come up with. Realizing that research only goes so far in the mission of bringing Sound and Energy healing into the mainstream, the Institute has also created a wide range of mass media entertainment projects with the underlying goal of educating the masses about the effectiveness of sound and energy healing. We have created a major play (some say similar to Cirque) that incorporates Sound and Visual healing in 3D. We have also created a major movie production that also incorporates a full range of Sound and Light healing components. We feel that once the masses know about the effectiveness of sound, the masses will demand it, bringing it into the mainstream.